Developed in a collaboration between Ryan Scott and Pete Schumacher of Vapor Audio, the BREZZA FORTE from Vehement Audio is a 3-way design that embraces the delicate details inherent to the Savants, while achieving full range performance. The RAAL 70-20XR tweeter blends seamlessly with their custom engineered SEAS 7” reed cone midrange, and is supported by matching dual 7” reed cone woofers. 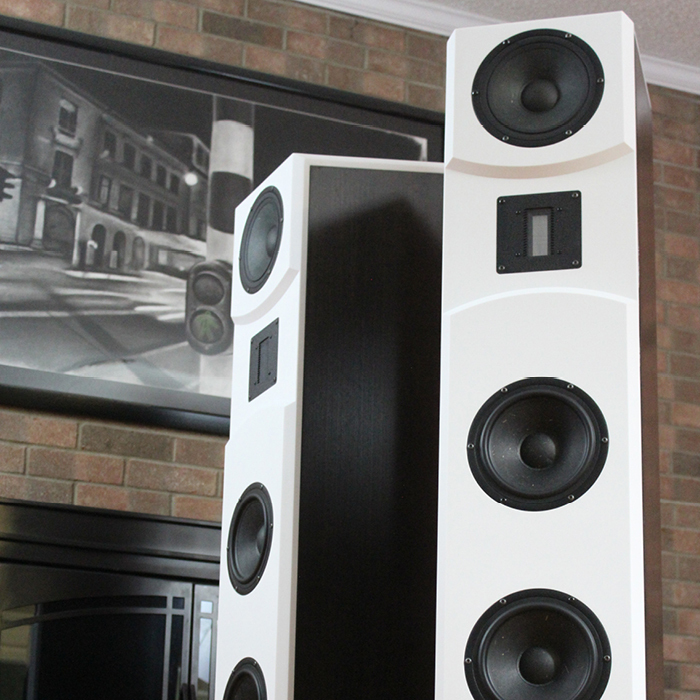 Each woofer is placed in a dedicated tapered transmission line for maximum efficiency and clarity. The entire interior is coated with Vapor Audio’s inversion layer technology making panel resonances essentially nonexistent. Each cabinet weighs 130 pounds and stands 52 inches tall with a towering acrylic resin baffle and top. Synthetic solids are dense, and their non-porous nature help to crystallize the sound-stage. Ryan Scott personally voiced the Forte to express a lively sound-stage that creates colorful images and delivers a truly engaging listening experience. The RAAL 70-20XR true ribbon tweeter is manufactured in Zajecar, Serbia by Aleksandar Radisavljević. Being a true ribbon, RAALs are known for their speed and ability to cast intricate images across the stage with unmatched precision. Recessed and time-aligned, the 70-20XR is an absolute performer capable of truly intimate expressions. Their custom SEAS 7” reed cone midranges seamlessly blend the RAALs with their supporting SEAS woofers. The dual 7” reed cone woofers are housed in a mirrored, tapered transmission line enclosure and each woofer has a dedicated chamber for optimal control.